You are at Naxian Capriccio, a restaurant which serves up modern Mediterranean flavours and aromas! Here you have the opportunity to enjoy a unique dining experience in the heart of Naxos Town (Chora), overlooking the indelible colours of the Aegean. You will certainly enjoy the most delicious suggestions made with fresh ingredients of the highest quality by our experienced chefs, who recommend daily the most sophisticated yet unpretentious gastronomic combinations, which are inspired from the Cyclades islands. 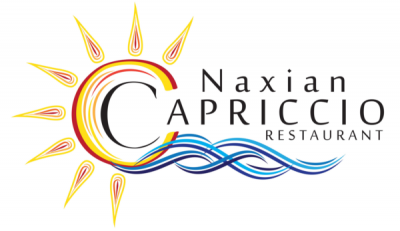 In Naxian Capriccio starts the beautiful delicious journey! Fresh salads, great risotto, delicious pastas and pizzas with Mediterranean temperament! Tasty recipes with fish or meat, of which the taste comes not only through the unique quality local products originating in the Aegean islands, but also from other parts of Greece. In that way we attempt a modern blend of flavours of yesteryear and today, always with respect to tradition. We plan our menu with the freshest, on season ingredients and we combine, with inspiration, the local tastes from the land and the sea. We also keep you up to date with the choices from the cellar and our wines so as always to offer the best accompaniment to the dishes you have chosen. It is not only our delicious creations that we offer to you, but also our very friendly staff who are always ready to serve, to advice, and to listen to you. Our constant aim is to provide you with a high quality standard menu in line with the best prices, indicative prices of €10 to €20 per person. After all this we are confident that we can offer you delicious and unique moments in the most beautiful part of Naxos.